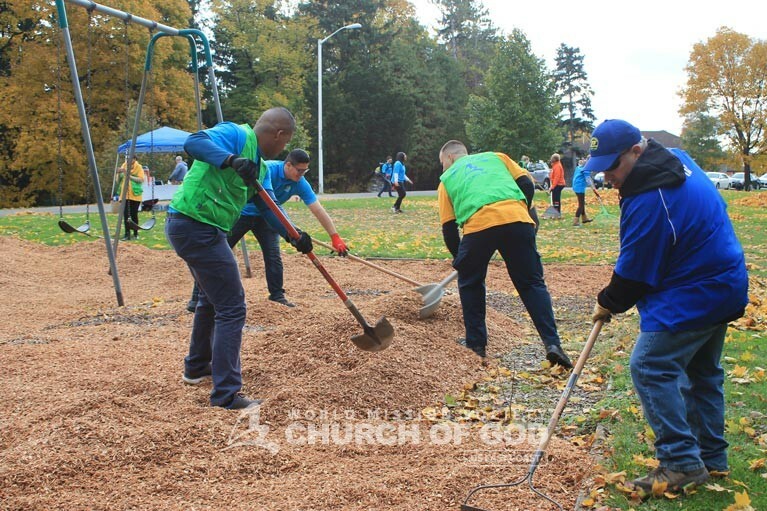 Approximately 30 volunteers from the World Mission Society Church of God’s student volunteer group, ASEZ, cleaned up Syracuse’s Thornden Park. They joined forces on November 4, 2018, as part of their worldwide “Reduce Crime Together” movement. Thornden Park is 76-acres of land nestled on the east side of Syracuse University. It’s famous rose garden, small stream, waterfall, and vast green fields are frequently visited by locals. Furthermore, both families and students enjoy its sights, athletic fields, swimming pool and playground. However, Thornden Park carries a negative reputation due to recurrent criminal activity. The film “The Lovely Bones” was based on true events that took place at the park—portraying the park’s long history with crime. In recent months, local university students and community members have been warned by the Department of Public Safety, Syracuse’s Police Department and the County Sheriff’s Department about streams of robberies that have been occurring at Thornden Park. According to the broken windows theory, visible signs of criminal behavior or disorder fosters further criminal activity. Based on this principle, ASEZ, which means “Save the Earth from A to Z,” is making efforts to clean and beautify campuses and communities worldwide. In doing so, they are promoting peace, happiness, and social cohesion among the global village. Following the example of God the Mother, who ceaselessly ensures the safety and well-being of Her children, Syracuse’s ASEZ young adults made it their goal to help Syracuse become safer. 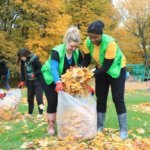 In accordance with their “Reduce Crime Together” initiative, they started by cleaning up the community’s staple—Thornden Park. ASEZ volunteers performed landscaping to beautify Thornden Park. Volunteers from ASEZ worked vigorously to remove piles of leaves from Thornden Park. To raise social awareness and encourage other young adults in the community to continue the effort, student volunteers promoted the cleanup. They involved several Syracuse University student groups with the help of the university’s Department of Public Safety. 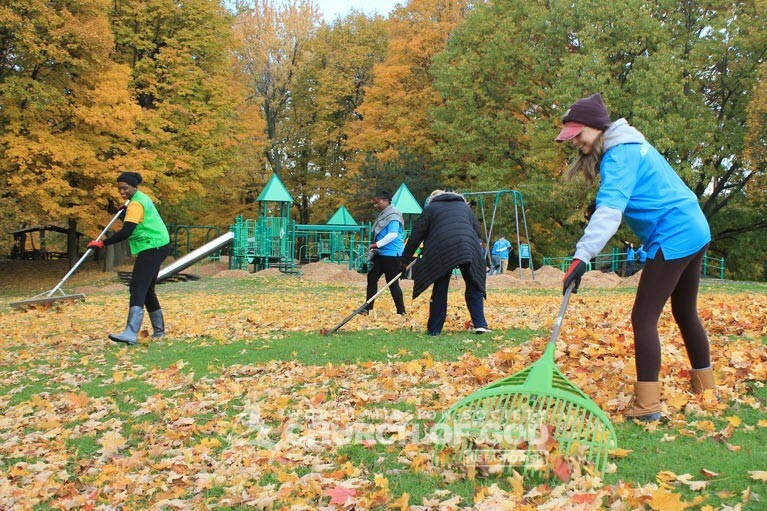 By promoting a clean and well-kept recreational space, the volunteers hope to reduce Thornden Park’s crime rate. 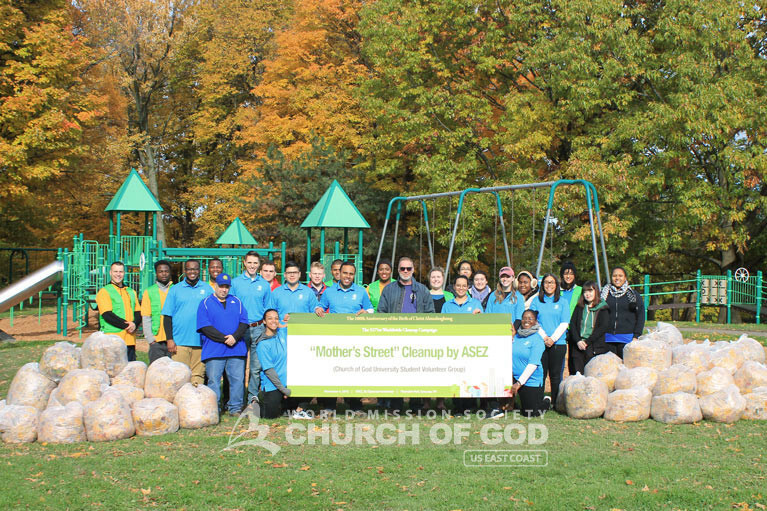 ASEZ carried out the cleanup in conjunction with Syracuse Department of Parks, Recreation and Youth Programs, who provided plastic bags and mulch. Many areas of Thornden Park had become disheveled; places such as the athletic courts, its two playgrounds, and pathway are overrun by weeds. To tackle the various tasks, the volunteers divided up into teams. 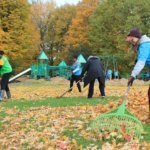 A handful of volunteers raked and bagged leaves, while others used leaf blowers to gather the leaves into manageable piles. Moreover. the remaining volunteers used shovels to lay fresh mulch on the park’s two playgrounds. 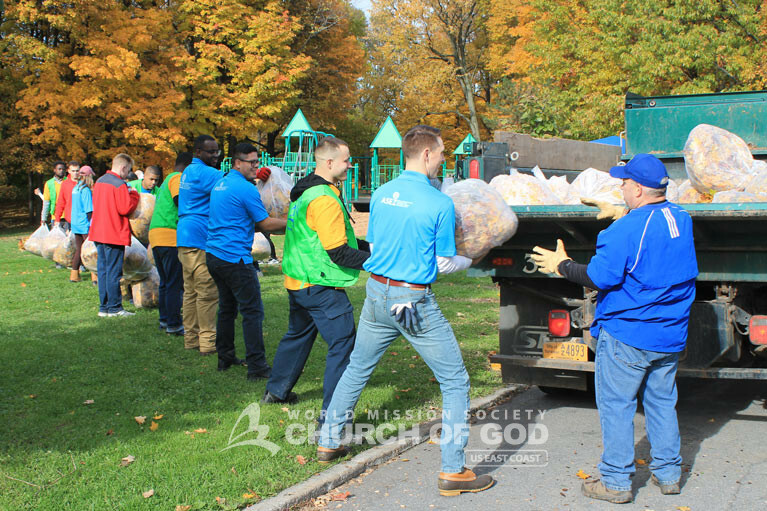 The volunteers concluded the event with joy as they gathered into an assembly line and passed along the 64 bags of leaves they collected. Additionally, the leaves collect amounted to 3,520 pounds. While packing up three truckloads full of bags, the group felt an overwhelming sense of accomplishment. The volunteers from ASEZ will continue to promote the movement to “Reduce Crime Together” to their neighbors and the leaders of the greater Syracuse area—fostering a clean, healthy and safe environment for all. 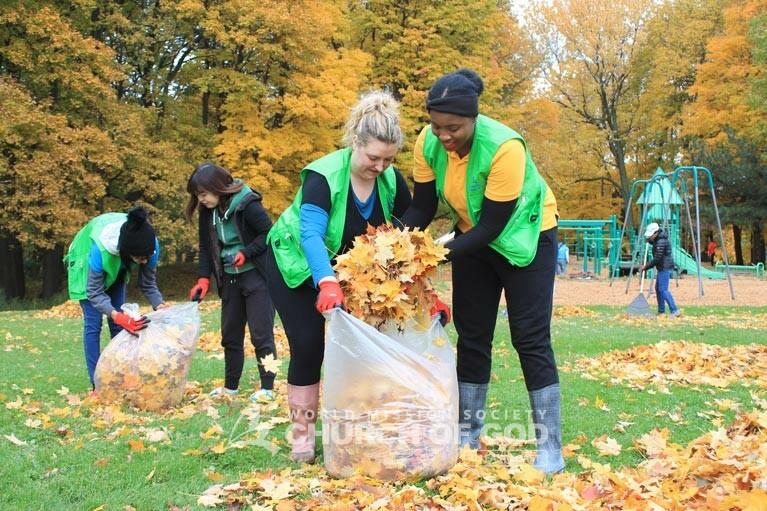 View ASEZ’s Thornden Park cleanup in the news! 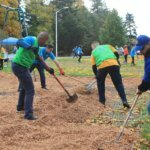 Volunteers from ASEZ put forth a united effort to beautify Thornden Park, which is a cherished location to the community. ASEZ hauled off 64 bags of leaves from Thornden Park during their “Reduce Crime Together” cleanup initiative. It is 100% true that if a place looks like crime happens there it will continue to happen there! It is wonderful that this park will now have a new reputation! A great one! Especially after getting a makeover from Asez volunteers! It was noticed by news stations, and will hopefully spark the people living in the area to have a new mindset about their park and their neighborhood!